In a bowl, combine 2 cups of flour and 1/4 cup granulated sugar. Mix in 3/4 cups (1 1/2 sticks) of softened butter or margarine with fingers until crumbly. With fork, stir in 2 egg yolks until dough holds together. Press dough with hands to make a smooth ball. Press dough into 4, 9 or 12-inch tart pans with removable bottom. Shoot for a crust thickness of 1/4 inch and lip of 1/2 inch. Extra dough may be flattened in a disk, wrapped in plastic and stored in a refrigerator for up to 2 days or freezer up to a month. Prick crust bottom all over with a fork. Bake in a preheated 375 degree oven 20 to 25 minutes( or 10 to 12 minutes at 425 degrees if you watch closely) until golden. Let shell cool on a wire rack then remove from pan. While tart shell is baking, prepare filling. Beat 1 (3 oz) package of cream cheese with electric mixer. Gradually blend in 1 cup of whipping cream. Add 1/2 teaspoon of vanilla, 1/2 teaspoon of grated lemon peel, and 1 teaspoon of lemon juice. Beat until mixture resembles stiffly whipped cream. Add 3 to 4 tablespoons of confectioners' sugar and beat until well blended. This filling may be refrigerated for up to 24 hours if necessary. Combine 1 1/2 cups red currant (or apple) jelly and optionally 2 tablespoons of Raspberry brandy(framboise) or orange liqueur(kirsch) in a small saucepan; bring to a boil. Cook until mixture pours from the spoon in drops. Brush a thin coating of glaze over the tart shell to seal. Allow to set for 5 minutes. Spread cream cheese filling in bottom of pastry shell. Arrange 2 to 3 half pints of raspberries on cream to achieve maximum visual impact Coat berries with remaining glaze using a very soft pastry brush. You may need to reheat the glaze to insure easy spreading. 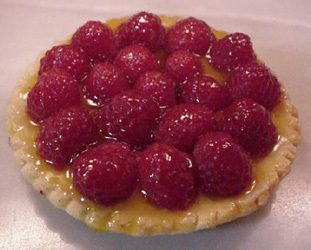 Refrigerate the tart until ready to serve.